Best thing I bought all year! I live in an apartment and do a lot of tailgating. This is the BEST grill! I get compliments on it all of the time. No one can believe that it actually does what it claims! 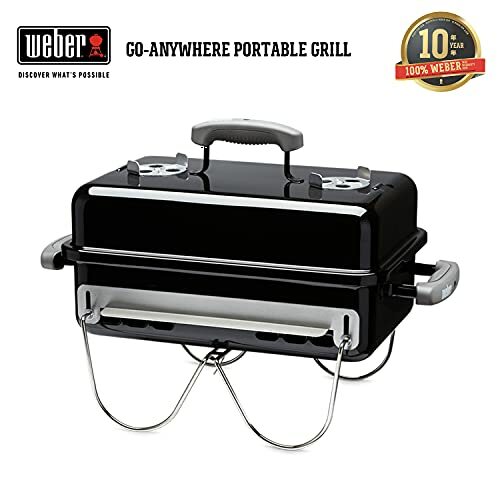 It has a big enough grill surface to cook for a party but it is small enough to pack up and take with you. It has become the main grill for home and travel. No one even offers to bring their portable anymore. It heats up very quickly and nothing sticks to the surface. I have used the grill for steaks, burgers, chicken, and to saute mushrooms and onions. I have never used any sort of non-stick agent. It is wonderful! It cleans up with just hot water in most cases! I love it so much that I am buying another one for my father for Father's Day! I love the Grill-2-Go. I use it every summer to cook in the Sierra Nevadas whilst waiting for the fireworks to start. The trays are stored on the inside of one of the legs. The legs fold neatly underneath. But, IT IS NOT AN OPEN FLAME GRILL. Sure, you'll lose some of the charcoal or propane aftertaste in your food. But you won't have to clean up the burned, oily bits that usually fall through a grill. The whole flame is covered by a teflon(?) griddle. It doesn't show in the picture very well, but on the side, there is a fat trap, or fat collector. 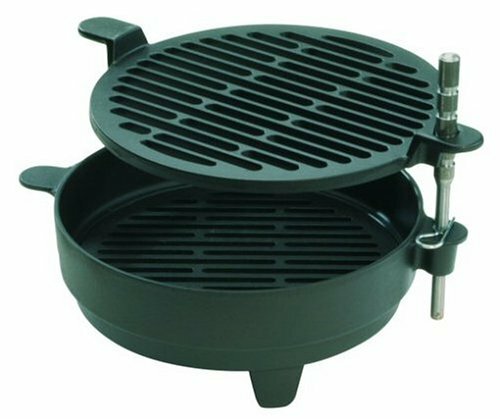 The reason why the Grill-2-Go has a level, is so that the grease will flow 'downhill' into the fat trap. From things like hot dogs, which exude little fat, almost nothing flows to the trap. But for larger meaty items, steaks and so on, the fat trap works well. 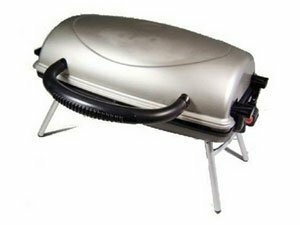 If your looking for something that is portable, easy to clean, and to be used in situations where you are 'roughing it' this grill is ideal. WE USE IT ALL THE TIME!!!!!!!!! My husband bought this grill last summer. 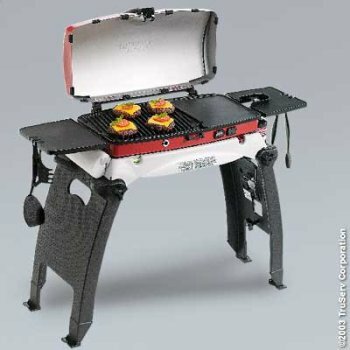 It has George-Foreman-type grilling plates inside..NO MORE MESSY GRILLS!! Oh, this grill makes grilling fun again! We just throw the heavy plates right into our dishwasher! No more scraping, grease fires, messy charcoal. I love it! 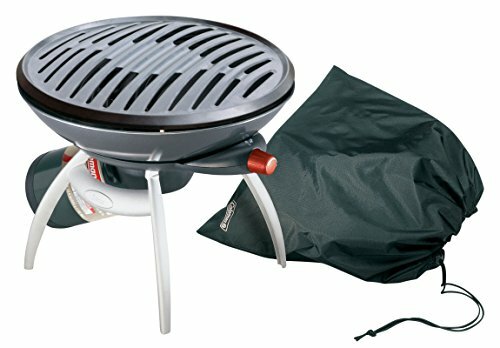 The orange portion of the grill (It has a briefcase style closure) pops off the black legs and you can take it camping, picnicing, or anyplace you can think of. It's lightweight and easy to carry or throw in your backseat or trunk. 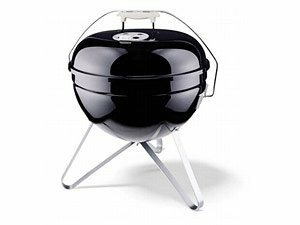 However, I only gave this product four stars, because, while the grill is incredible, the black legs are made from hard plastic. They seem a bit "cheap" to me as compared to the grill itself. They are not flimsy, and I do need to say that while they may be plastic, you have to keep in mind the grill in whole doesn't weigh very much. So, It really doesn't matter much in the in the long run, unless you are very finicky. 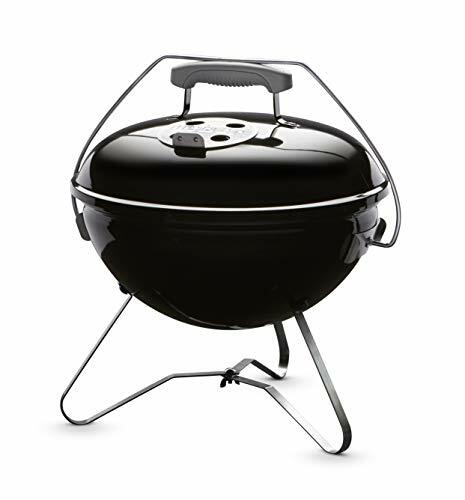 This is a fantastic compact grill(the namebrand speaks for itself). Forget the mess of others. 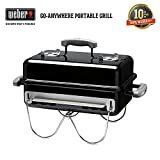 Just a note of advice: the grill has some black plastic grilling utensils in the box...if they are not to your liking, make sure you use ONLY plastic on the grilling plates. If you don't, the protective non-stick coating will be damaged. Happy Grilling! We took the portable grill on a camping trip without having ever had a trial run. We had an old Coleman stove for a backu0 for a backup. This product was the hit of the trip. I had never cooked using gas before. I was not sure that the grill would stand up to repeated use because of the dertachabvle legs. We had no problem. We cooked breakfast and dinner. We had eggs and bacon one morning, and pancakes the next, using the griddle attachment. We grilled salmon, using the grilling plate for dinner. We had a lot of rain, and the others kept saying that my grill saved the day! The campers were six adults, ranging in age from 55 to 65. We are going to capm for a few days this year also. They keep saying, be sure to bring your grill. It took up only a modest amount of space. One problem. 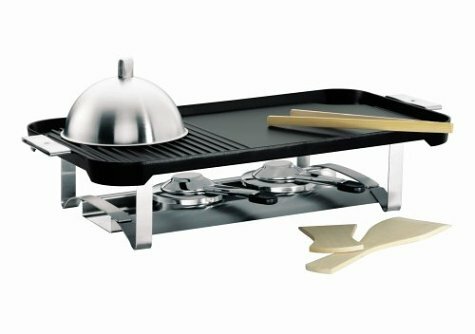 I am trying to buy additional grill and griddle plates. One of each comes with the grill and I want to have two of each. I cannot find how to do that online. I'll try the telephone number. Grills pop out for easy cleaning and are dishwasher safe. Folds for quick transportation and easy storage. Built in light for cooking outside in the evening and low light. Heat controls for both sides. 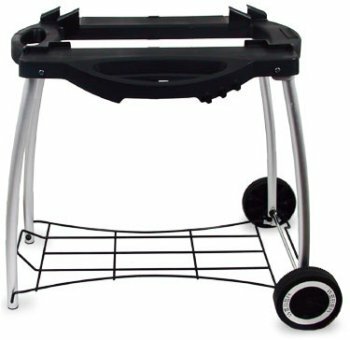 The propane Coleman party grill is easy to carry, easy to assemble, and most importantly, easy to use. 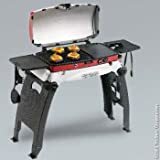 If you're searching for a reliable, portable grill for tailgate parties, fishing trips, or quick backyard barbecues, don't overlook this Coleman. 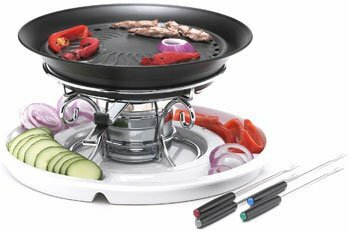 Besides grilling burgers, the Coleman party grill is also great for boiling: simply remove the nonstick grill and place your pot of water (or soup or veggies) on the grate to boil. Then replace the grill to prepare burgers, chicken, or even salmon. A small section of the grill is solid and flat for use as a griddle: cook morning eggs or thin slices of meat such as bacon or fish. The cooking speed is greatest in the center of the grill and slower toward the edges. 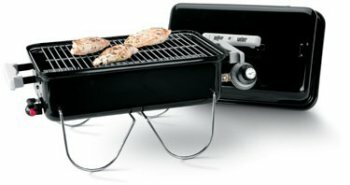 I bought this grill for my brother who travels about alot and camps usually out of the back of his truck.. He likes unusual things and this fit the bill. He did loose his brats once, they rolled off. Fortunately, he was at home in his drive way at the time!! He really likes this grill for it's packability and ease of use and clean up. 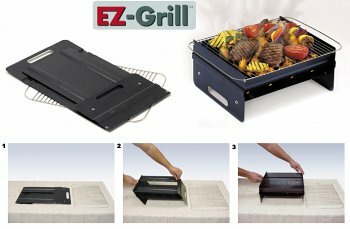 According to the folder you can use it either as an open grill or with the upper griddle. You don't really need the griddle most of the time and you're better off with just the open grill (It's also easier to clean up afterwards.) However, you should definitely use the water pan for a better heat distribution and again-easier to clean. The griddle is nice if want to do eggs, bacon, fish, etc. but it should be considered as an accessory and not part of the main deal. So if you're travelling-leave the griddle at home-it's much lighter and easier. But it's still there if you need it and could come in handy (some of the time). had some great steaks cooked on it but now the teflon coating comes off the rost. Used it for roughly 50 times and never maintained it well though. 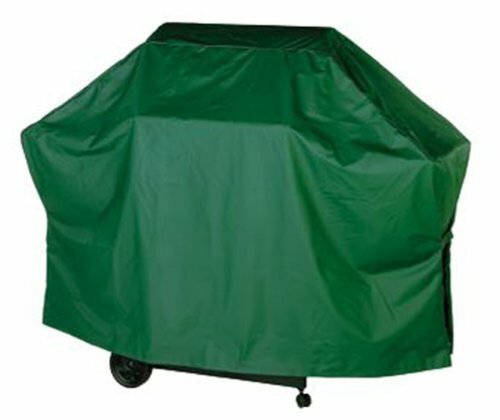 Perfect to take to the beach, picnicing, hiking, camping, or wherever you want to enjoy grilling. 1100 watts. Do not use cooking spray on grill top surface or on raclette dishes.